Enhance your Red Rock Canyon Classic Tour with a rollicking off-road ride. See all the same sights and natural landmarks, with the addition of a fun jaunt in our custom-built Wranglers. 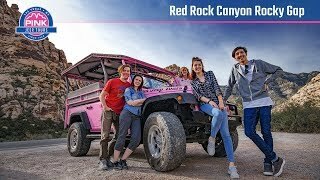 After a quick trip from your Las Vegas hotel, you’ll hop into our signature Pink® Jeep® Wrangler and begin your trek. You’ll love the open-air experience and elevated panoramic views. First stop, the Visitor’s Center. You’ll see desert tortoises in a protected habitat, and—if you’re lucky—meet the Mojave Desert’s official mascot: Mojave Max. Get your fill of educational exhibits and souvenir shopping before jumping back in the Jeep. Next, head out on a scenic 13-mile ride through the desert. Your guide will treat you to an incredible view from Red Rock Overlook and other outlooks along the way. Don’t hesitate to ask for periodic pit stops at any other compelling places you spot. Along your journey, you’ll enjoy views of the 3,000-foot-tall Wilson Cliffs (also known as the Keystone Thrust). Thousands of years ago, they were a natural canvas for ancient tribes. Their art is still visible today, and your Certified Interpretive Guide will tell you all about them. As you roll into The Spring Mountains, named for their numerous streams, you’ll see an impressive array of flora and wildlife. Ask your guide about the 600 species of plants that flourish here, and keep your eyes peeled for animals scampering through the brush. The kaleidoscopic colors of Calico Hills are next. Watch the hillsides for a display of pinks, oranges and reds that change throughout the day. Your expert guide can also point out the natural tanks that store water in the hills, along with ancient plants and animals preserved in the layers of ancient dunes. Now things are about to get even more exciting. Your guide is not only an expert in natural landscape and landmarks, but also a trained off-road driver. Hang on as they pilot the Pink® Jeep® Wrangler over the loose terrain and steep hills of Rocky Gap Road. An old wagon route used by pioneers, this trail is truly rugged, so get ready for a fun ride and enjoy your chance to see what these custom-built vehicles can do! Your tour includes bottled water and any necessary parking and admission fees so you can focus on fun. We had a blast! Our guide Bill was fun (he kept up with our crazy humor!) and knowledgeable and everyone survived the trip! Red Rock Canyon is just breathtaking and not to be missed. The tour guides are a lot of fun. Bill was like our crazy uncle that made the trip fabulous! Loved the off-road experience! Guide was friendly and so full of interesting facts and stories. Scenery was breathtaking! Oh the smell of fresh sage! Felt completely safe at all times. We had a wonderful time. Our guide Jack Anderson made the experience one we will never forget. We had s great time, our guide, Jack Anderson was knowledgeable and made our tour fun, also he adde an element of extra photo ops to the tour. I will highly recommend this tour to our friends and family. The whole idea is fantastic. Loved off roading and have great photos as memories. Just wish the tour guide was a little more vocal. Definitely the highlight of our trip! Would recommend to anyone. Had so much fun and our guide, Bill , was fantastic. Art got us to and from the hotel with ease and was very informative. We will be back again. Thanks for the adventure! We had a great experience with Jim and the snow, cloud formations at red rock canyon made it an exceptional time.